Looking for professional repair and installation services for the garbage disposal in your Barrie or Bradfordhome? Call M.A.C. Stewart plumbing Plumbing at (705)7335154 and get immediate attention today! Few things are more frustrating than a kitchen sink that won’t drain due to an inoperable garbage disposal, and we understand this 100%! Over time, your garbage disposal may experience some issues such as a garbage disposal jam, a stinky odor, or leaks coming from the hose and seal of the garbage disposal unit, but have no fear! M.A.C. stewart Plumbing has the right solution for you! We provide York Region, ON and the surrounding areas with efficient and professional repair services. What Causes a Garbage Disposal to Become Damage or Stop Working? One of the most common reasons for a clogged or damaged garbage disposal is grease. When the grease that is on your pans or food items is washed off, it will come off in the water and build up on all the pipes. Over time the grease will become thick and can cause the garbage disposal to shut down or not work as well. When that happens, food will clog and water will build up in the sink, making it hard for the water to go down the drains. Additionally, things that are hard to break down like egg shells and banana peels can both create damaging conditions for your homes garbage disposal. Why is there an Odor Coming From Your Garbage Disposal? Another common issue seen in garbage disposals is bad odors. This occurs when food gets caught in the garbage disposal and starts to deteriorate. The odor can be overwhelming and hard to get rid of. While some customers may attempt to remedy these issues, without the proper damage you can cause a more serious issue or worst of all hurt yourself. M.A.C. Stewart Plumbing can help you get rid of the embarrassing and bad odor. We have the perfect products to get the job done quickly and efficiently. We will even get rid of all the unwanted food that was left behind in the garbage disposal. While there are many reasons why a garbage disposal can malfunction, repairs is one of the few solutions. Repairs include the inspection of the garbage disposal and replacement of damaged or worn parts. Additionally should there be food stuck inside, the removal of this odor causing issue can also be remedied. While maintenance can prevent these issues, once you have them seeking professional services is always the best course of action. M.A.C. Stewart Plumbing has the right solutions for you! Our expert technicians can ensure that your system is cleaned and functioning without breaking the bank. Call us today! In certain instances, especially if misused or extremely out-of-date, replacing your garbage disposal may be your only choice. While this can be a stressful situation, it can also be a blessing in disguise. 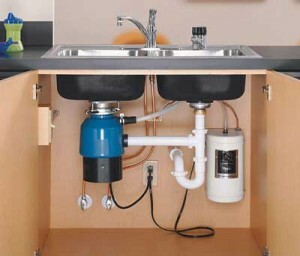 When replacing your garbage disposal you can ensure that your new unit is efficient and satisfies your needs. Additionally, by using the professional services from M.A.C. Stewart Plumbing you can have peace of mind knowing our installation services come with you 100% satisfaction.